Manchurian is a very delicious Chinese dish which i mostly prepare with chicken. Here i just tried the same recipe with Prawns / shrimp which came out very well. Most of the Chinese cuisines are loved all around the world equally. I noticed this dish once i ordered prawn Manchurian from a restaurant. It tastes really good and i loved it. This very taste made me to try on Prawn Manchurian. 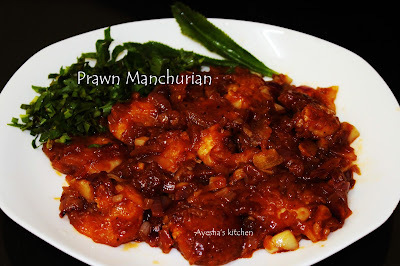 Here is the recipe showing how to make restaurant style prawn / shrimp Manchurian (without gravy) . Do try this yummy recipe at home. Make a thick batter with the marinating ingredients and set aside. Do not mix the prawns now. Heat a wok with oil and when hot, dip each prawns in this batter and deep fry till crispy in hot oil. Fry in batches. Set aside. Now heat a wok with some butter / oil. Saute garlic chopped, ginger chopped for 1 minute. Then add chopped onion and spring onions. Toss for 5 minutes. You can also add bell peppers. I don't have any so i skipped that. Combine together soy sauce, chilly sauce, tomato sauce, vinegar, sugar, salt,chili powder in a bowl. Mix well. set aside. Pour this saucy mixture to the sauteed mixture and give a fine stir. Then add, 1 tsp of marinated batter mixed in 3 tbsp of water. Mix until it slightly thickens. Do not add more batter. (If u want more gravy, mix 1 tbsp of cornflour in half a cup of water and add it to this sauteed mixture). Now add the fried prawns to it , toss very well and let it cook for few minutes in a low flame. When done remove from flame and garnish with spring onion or chopped coriander leaves. Serve hot with fried rice. Yummmy!!! !